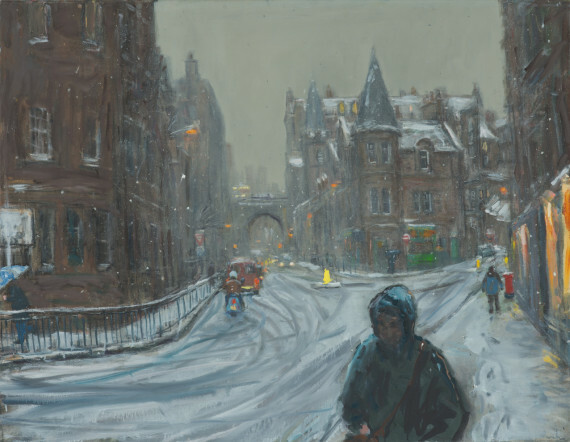 The Edinburgh-based painter receives £15,000 prize for his representational painting of the Scottish capital's old town. The winner of the Lynn Painter-Stainers Prize 2016 is Henry Kondracki for his oil painting, The Cowgate. He receives prize money of £15,000 and an engraved gold medal. Now in its 11th year, the open submission award is presented by The Worshipful Company of Painter Stainers and the Lynn Foundation. Its focus is draughtsmanship and representational painting. Other awards presented at a ceremony last night include the Young Artist Award of £2,500, awarded to Bernadett Timko for her oil painting Studio 7. Timko is currently studying portrait painting at Heatherley’s School of Fine Art, London. The £5,000 Brian Botting Prize went to Charlie Schaffer for his painting Madonna. Five Runner-up prizes of £1,500 each were awarded to: Benjamin Andreas for Hoxton Square Daytime; Peter Clossick for Garden; Joe Fan for Fontainebleau Reconstruction; Ian Rowlands for The Pond; and Neale Worley for Model. An exhibition at the Mall Galleries, London features 139 works selected by Howard, fellow artists Catharine Davison, James Lloyd and Sam Wadsworth, and Andrew Wilton, Visiting Research Fellow at Tate Britain. The exhibition continues until 13 March and tours to Guildford House Gallery from 25 June–17 July 2016.